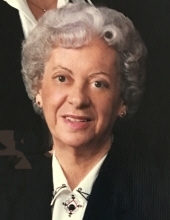 DURHAM: Rachel Elizabeth Rigsbee Carter, 91, passed away on Thursday, January 24, 2019 at Hock Family Pavilion in Durham. She was born in Durham to the late George Isaac Rigsbee and Dora Elisabeth Hester Rigsbee. In addition to her parents, Ms. Carter was also predeceased by her husband, Mack Carson Carter; and brothers, Earl and Carl Rigsbee. Ms. Carter was a member of Immanuel Baptist Church where she was involved in the Joy Senior Group and the Truth Seekers Sunday School Class. She was a former member of the Ciola Cross Missionary Group. Ms. Carter retired in 1985 from Burlington Industries after 35 years of service. Ms. Carter is survived by her daughter, Shirley C. Williams and husband Ken; grandson, Stuart Alan Williams and wife Jennifer; and great-grandchildren, Bryce Williams, McKenna Williams, Addison Williams. A funeral service will be held at 2 p.m. on Monday, January 28th at Clements Funeral Chapel with Rev. Earl Echols officiating. The family will receive friends prior to the service from 1 to 2 p.m. at the funeral home. Burial will follow the service in Maplewood Cemetery. In lieu of flowers, the family request that memorial donations be sent to Immanuel Baptist Church: 3610 Hillandale Rd, Durham, NC 27705. To send flowers or a remembrance gift to the family of Rachel Elizabeth Rigsbee Carter, please visit our Tribute Store. "Email Address" would like to share the life celebration of Rachel Elizabeth Rigsbee Carter. Click on the "link" to go to share a favorite memory or leave a condolence message for the family.